Teachers have a lot of influence in your child’s life. And since you two are supposed to be the same team in trying to ensure your child is successful in school, it’s important to know how to effectively communicate with your child’s teacher. I’m offering up some ideas you can use to ensure you do that. After working with my son this summer, I knew he was going to have some problems going into the school year. Instead of waiting, I picked up the phone and reached out to our principal to let her know that we were going to have to work as a team this year to help keep my son on track. The first phone call can sometimes be the hardest but it always better to reach out now than to discover something later. As soon as you can, make an appointment to meet with your child’s teacher. If you can do that before the school year begins and there’s no pressure on either of you, it might be the best choice. However, that’s not always possible or realistic. By starting your relationship off early, there won’t be problems to contend so it should help it start on the right foot. Then, later in the year, if your child does have problems, you’ll already have effective communication established with your child’s teacher. Don’t wait until there is a problem before you meet your child’s teacher. If you’re already into the school year, it’s not too late! Call now to connect with your teachers. Don’t wait until a mid-year conference to find out something is going on with your kiddo at school. Let the teacher know you want to be considered a partner in your child’s education. Ask them what you can do to help your child. Ask them how you can extent the learning process at home. Reach out via email and You may be surprised at their suggestions. Find out when your child’s teacher has a break during the day. If you have an opportunity, stop by the school to see if there’s something you can do to help them. You can also become involved in the parent-teacher organization or volunteer to help in your child’s classroom. What better way to keep a pulse on how your child is doing than by having a presence within the actual classroom. Be sure to take the time to look through your child’s backpack or notebook for any notes they may send. Many teachers, especially of younger children, send a notebook or some other type of communication home with your child at the end of the week. Then, once you’ve read them, you can either send a note in response or simply initial it so they know you have read it. At some point you may notice a problem your child’s teacher may not be aware of. Has there been a death in the family? Are their problems at home between family members? Send a note to your child’s teacher or call them to bring them up to speed on the situation. Just because you don’t see a change in behavior doesn’t mean the teacher doesn’t. Your child may begin to show out or cause disruptions in class and this knowledge will help the teacher understand why and how to manage it. Follow through with any promises you’ve made. If you say you’re going to something, be sure to follow through. Of course, there may be circumstances where you won’t be able to, but you’ll want to let the teacher know what’s going on. Remember the importance of knowing when to communicate and how often to communicate with your child’s teacher. 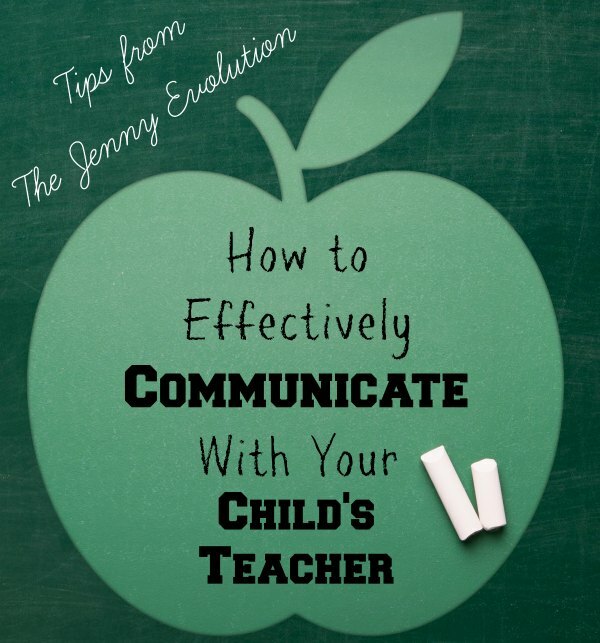 Learning how to effectively communicate with your child’s teacher can make all the difference in your child’s educational success. These tips really would work for all sorts of families! Fabulous. As a teacher and a parent, following through on the promises part is they key. You would be surprised how times parents do not follow through with their part of the bargain, then they get mad at the teacher and it becomes a horrible situation. A couple of more tips: If you are divorced, please do not degrade your ex with your child’s teacher to show that you are the better parent. I can’t tell you many times, this has happened. Do not make an end run on your teacher-which is call the principal, school board or other district administrator first before you talk to your kid’s teacher about a problem. If it is something illegal or safety-releated yes but not because little Johnny came home and complained that the teacher made him wear a jacket because it was raining and he said he became anxious or some small issue. Try to work it out first with the teacher. BE ON TIME for appointments and meetings. I can’t tell you how many parents think that shopping at Wal-mart (This was an excuse that was given to my admin, why a parent was 45 minutes late and then got mad because I waited around and left after 30 minutes since they were a no show and did not call) or not showing up at all. Remember that your child’s teacher really wants to help and wants to educate your child. They also want to communicate with you. What is sad is that many parents today think that schools are respite care and that they can just demand anything they want, when they want. You gave great advice. Those are all great tips… it never even occurred to me that people would show up for appointments late. They made the appointment for a reason! Great tips, teachers are so important it’s great to have other ways of communicating and working together. Thanks for the tips Jennifer. Absolutely, Heather! Teachers are an important part of your child’s team and they want to be included. Communication is absolutely the key.